If you’re thinking about tiling your family bathroom or have actually decided to go ahead and do it then you’ve probably found a massive range of options ahead of you. Whether it’s tiled walls, tiled floors or both you’ll be inundated with stunning, and some not so stunning options. Each to their own and all of that! Tiled walls and floors are a major part of any bathroom design, even just from a functionality standpoint. Easy to clean and hard to break, it’s almost a guarantee that your bathroom features a variation of tiles and design. The only difficult part is figuring out which ones are best. When you think of tiles it’s easy to just think of ceramics, but materials vary widely including porcelain, marble, stone and glass. Different materials can affect how your tiles will look and how they’ll handle water – for example, natural stone tiles can look rustic and stylish, but they need extra attention and materials to make them properly waterproof. On the other hand, ceramic or marble tiles are more run-of-the-mill, but can be installed with very little fuss and won’t need treatment for waterproofing. 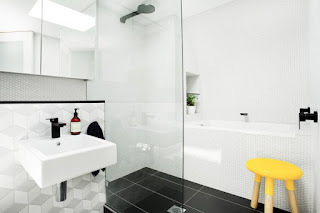 Of course, it’s not just the look you have to consider – some bathroom floor tiles may become slippery when wet so a family bathroom will benefit from non-slip options. Before choosing a tile material ask yourself - Are you going to put a rug or bath mat over them, or walk on your floor tiles barefoot? Is the floor likely to get really wet, or not very? Do you have children who could slip or hurt themselves on it? These are all things you’ll want to keep in mind before committing to a certain style of tile for your bathroom floor. The more obscure or exotic your material, the more difficult it can be to find variants that actually suit your bathroom. Granite can come in a variety of colours and styles, and can be carved into many different shapes, but things like travertine do not have a wide range of complex patterns without you getting them custom-made individually. If you’re dead-set on wooden flooring, then you may be happy to learn that there are wood effect tiles out there. There’s also marble effect for those who want a beautiful look but don’t have the budget of the Royal Family. Just because you’re decorating a family bathroom doesn’t mean that it can’t be stylish. The style of your wall tiles and floor tiles is just as important as the material and finish. There’s lots of styles around and some of the most popular are patterned tiles, hex tiles and metro tiles. Patterned tiles allow you to get a Spanish tile feel as well as creating gorgeous feature walls or floors. Hex tiles, also known as hexagon tiles, have really grown in popularity and they look great as a full wall or floor, although many creative home owners are tiling halfway and then finishing off the area with a plain tile for an awesome effect. Metro tiles have been popular for a few years now, but there’s no sign on them slowing down. They’re perfect for both modern and traditional settings and are a straight forward and beautiful wall tile option. Or, you could even mix styles and materials – if you’re not worried about potentially paying a little more, you could create a nice pattern out of different materials, sizes, colour and carvings. The same goes for the floor: why not create a little ‘path’ from the door to the bath, or colour-code different parts of the wall that have certain shelves on them? There’s plenty of ways to find something to make your bathroom unique. Finally, keep in mind that a family bathroom isn’t just for you – other family members will have to look at these tiles day in day out. Get opinions from them, not just yourself – the huge variety of materials, designs and colour available at most retailers means that you’ll be sure to find something that can satisfy everybody in the family!